From Russia with Science – the Future Fibre has Arrived! Alchemie is the co-developer of AuTx yarns and the sole supplier of AuTx textile solutions made from AuTx yarns – a “next generation” aramid, with twice the toughness of para-aramids, produced by Kamenskvolokno JSC. Alchemie claims that it can produce combat clothing which can provide up to 10 times more protection at significantly less weight. Q: In as brief and lay terms as possible, can you explain the science behind so-called “terpolyaramide materials.” What is an aramid, and what makes “terpolyaramide” fibre solutions such as AuTx, better, stronger, lighter than the more familiar aramid fibres such as Kevlar and Twaron? A: The AuTx fibre falls within a class of chemical fibres known as aramids, developed in the 1970s. Aramid fibres have high strength and thermal resistance and are used in protective clothing and composites for aerospace, defence, industrial and other applications. AuTx is an improved heterocyclic copolymer (terpolyaramide) fibre made using a very specific fibre spinning process and is produced by Kamenskvolokno, Russia. Terpolyaramides have a similar chemical structure to para aramids (like Kevlar and Twaron) incorporating the same two monomers that make up para-aramides, but also include an additional monomer which adds unique physical properties. The yarn can be uniquely modified during the production process to obtain the optimum balance of properties for specific applications. These unique properties for personal protective applications include enhanced toughness, thermal resistance, cut resistance, printability, etc. Q: Your protective textile solutions claim to deliver 10x the protection at the same or less weight then existing fielded materials, is that accurate, and how is that possible? A: Combat uniform materials are currently made from relatively “low performance” textiles such as: polyamide, viscose, polyester, cotton, para-aramid and meta-aramid. AuTx has a tensile, tear and burst strength more than ten times greater than most textiles used in soldier’s clothing and just one 110gsm layer of a camouflage AuTx textile meets the USA base protection level requirement against fragments of 700fps for a 2grain fragment simulation projectile. AuTx yarn can be produced in very thin fibres and can be woven and knitted into very thin textiles then fleeced, printed, coated, laminated, etc. It is such a flexible material that we have been able to redesign the complete clothing and protection/ load carriage system that the soldier uses. For instance rucksacks and assault packs can be produced weighing less than 0.5 kg; base and outer layers, assault suits etc. made at a fraction of the weight of existing best practice gear. Simply by replacing these “low performance” textiles with high performance multi functional AuTx fibre’s the mass of a dismounted soldiers personal protection and load carriage equipment can be reduced from 15-25kgs to 10-5kgs. A personal protection and load carriage equipment set includes helmets, body armour, rucksacks, pouches, webbing, load distribution and stabilisation frame, clothing, boots, sleeping system, etc. This saving in weight is also of course accompanied by much greater functionality – increased fire, chemical and ballistic protection. It is the increased functionality combined with the weight saving that makes solutions made from AuTx so exciting. The overall benefit is achieved not only through use of the specific yarn range, but also through unique application engineering starting from types of materials the yarn is processed into, through its treatments to the final garment design. Understanding the end user needs and providing an optimised solution by optimising everything from the yarn to the final garment design is what Alchemie specialises in. A: In designing any solution we had to carefully consider all aspects of the operating environment from high temperatures to arctic conditions, from desert to underwater; and where weapon threats can differ just as much as the environmental conditions. In some areas for instance needles are much more of a problem than knifes and bombs and different gun and bullet types used in each territory. Because AuTx has such a wide functionality and inherent advantages we can design special protection against environmental and ballistic threats for each theatre of operation and also make sure we provide garments that suit the appropriate weather and operating conditions. Comfortable base layers, mid and outer layers made of AuTx give protection against IED fragments and minimise the damaging effect of organic fragmentation / dirt ingress into the flesh during an IED attack, which can reduce operations and injuries by 75% . Q: I have read that a dismounted soldier’s physical efficiency can be improved as much as 30% or more by taking 10kgs of textile “dead weight” off his or her body. While I am in no way trying to imply a value on the safety of a warfighter, can you relate that figure to AuTx protective solutions and how such a reduction saves more than only lives? A: The primary occupational task of a dismounted soldier can be described as carrying weight - currently 50-60 kgs or 35 kgs if the “irreducible minimum” that the British Army talk about can be achieved. Above this 35kgs load there is significant degradation in a soldier’s both physical performance and cognitive ability that leads to not only a great loss in performance but also to poor mental alertness that can and does cause mistakes. The equipment weight currently consists of 15kgs (assault order) to 25kgs (winter patrol order) of textiles and 5-8kgs of ceramic composite armour plates. Therefore the dismounted soldiers only have 15kgs of effective payload, or only a maximum 43% of their load is truly functional. By replacing “low performance” textiles with high performance multi functional AuTx textile the mass of a dismounted soldiers personal protection and load carriage equipment can be reduced to 5kgs. This saving of 10kgs of “dead weight” allows an increase of functional payload, which represents a 1,6 times improvement in the effective payload or increase from 43% to 71%! Dead weight can be reduced further by using AuTx composites to make most of the other items of equipment a soldier uses. Put another way a reduction in non operational payload of 10kg could increase the efficiency and effectiveness of the soldier by 30% (speed, manoeuvrability, cognitive effectiveness or more effective payload, etc.) Current UK & US costs to deploy and maintain a dismounted soldier in expeditionary warfare are currently in the region of €2 million /annum, this figure is even higher for special forces. This means that every carried kilogram costs €40,000/kg/annum in the case where the total carried weight is 50kgs, which is inefficient, ineffective and unsustainable. In the case where 35 kgs is carried if the “irreducible minimum” can be achieved = €57,000/kg/annum. As explained above the weight includes 15kgs or more than 40+% of just textiles, making the cost of the 20kg of effective load a dismounted soldier carries over €100,000/kg/annum. Through the use of AuTx materials the textile/ composites burden of the dismounted soldier/special forces operative can be reduced by 10 kg for assault (load of textiles) or 15 (patrol load of textiles) kgs. This is a potential saving of over €500,000 / annum from just 5 kgs of AuTx. This could save the tax payers who fund expeditionary forces over €500,000 per soldier per annum, or approximately £1bn per annum for 2,000 dismounted soldiers through increased operational effectiveness and reduced injuries through additional protection. In addition the ruling in June this year by the British Supreme Court stated that the British Government has to abide by the European Convention of Human Rights for soldier safety. This ruling implied that all military personnel, not just British soldiers, from European Union countries are protected even on active duty outside the European Union by the European Convention of Human Rights. Nation states even in a state at war must do everything they reasonably can to limit their casualties, including procurement of adequate equipment for their soldiers. The economic and legislative factors leads to some interesting questions. Is sending soldiers into an environment where IEDs are used as weapons, wearing combat uniforms made of low strength fabrics that offer almost no protection to an IED compliant with British and EU law? Does sending a soldier that cost €2 million per annum to hump around 10-15kgs of “dead weight” in the form of low performance materials make any economic sense? Q: So where are we in terms of development of AuTx uniforms? How soon could we potentially see them in the field? As a company, is your goal to produce and field actual combat uniforms, rucksacks helmets, etc. using AuTx aramid fibres, or supply the textile to those who will then create the garments, or both? 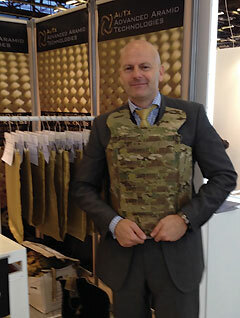 A: The ballistic and other properties of our new materials have been tested by a number of military organisations and we are now at the exciting stage of creating our own Front-line Personal Protective Apparel and Equipment range that can be delivered as fast as possible to those service men and women serving on the Front-Line. It is a huge range of clothing and equipment from socks to full battle armour, from combat base layers, military swimmers suits to load carriage and parachutists harnesses. As I like to say during some conference presentations, if you have to pass electricity through it, eat or drink it, or use it over 400oC then don’t use AuTx... anywhere else is fair game! That leaves about 75% of the soldiers load where AuTx could be used. Never in the history of dismounted soldiers has there been such a revolution in materials science. As developers and innovators we are also very happy to supply the materials to other innovative companies so that the maximum potential and benefits of these fibres and materials made from AuTx can be delivered as fast as possible to service men and women serving on the Front-Line.